Your entryway is the first thing guests see when they walk through your front door, so having a warm, welcoming spot filled with greenery, art, and decor is always a nice touch. What's also nice? Having extra storage space to stow away all the things you don't want to showcase — like pet leashes, tools, flashlights, and coupons. 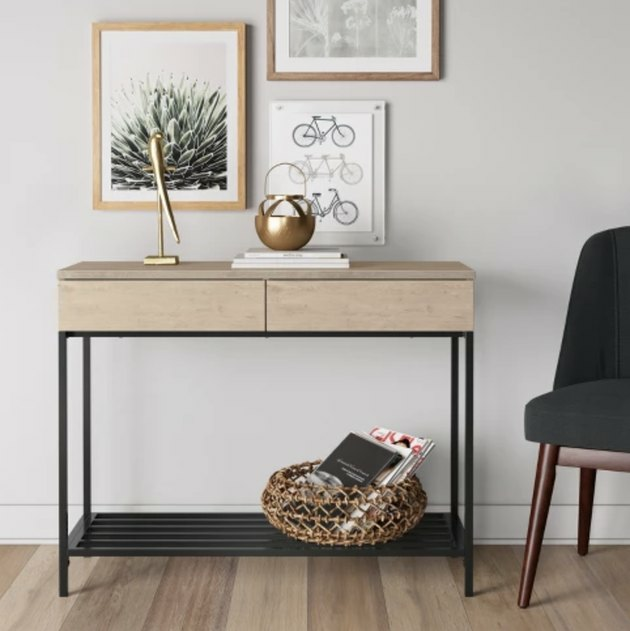 We rounded up 14 statement-making entryway tables with tons of storage that aren't heavy on your wallet. 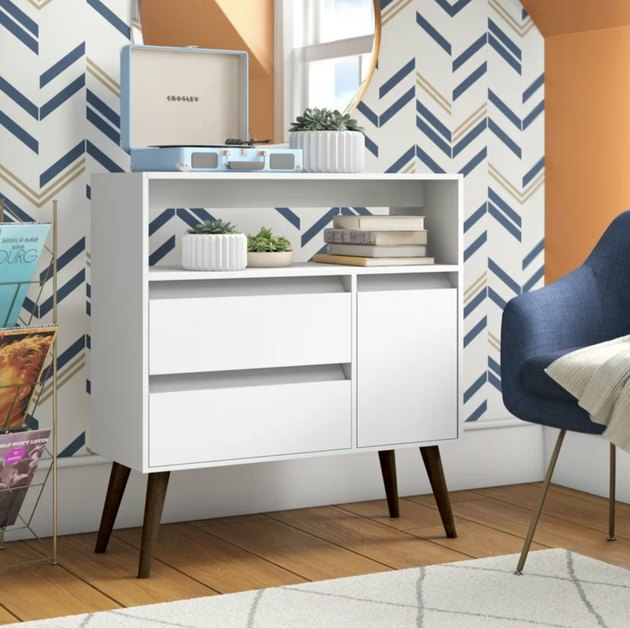 The open shelving of this chic cube entryway table allows you to display art, books, or ceramics, while the cabinets help you to conceal everyday items like bills and umbrellas. Midcentury-inspired, this tobacco-stained entry table features two large drawers and open shelves at the bottom for plenty of storage. Just top it off with a handmade dish for keys and some greenery for a stylish look in your foyer. 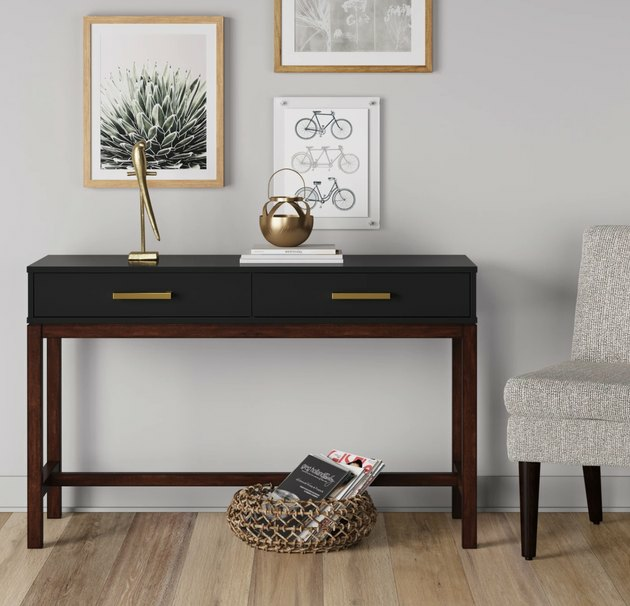 Perfect as an entryway piece to hold your everyday essentials, this two-tone matte black and espresso table has spacious drawers (with pretty gold accents!) and tons of surface space for showing off goodies. 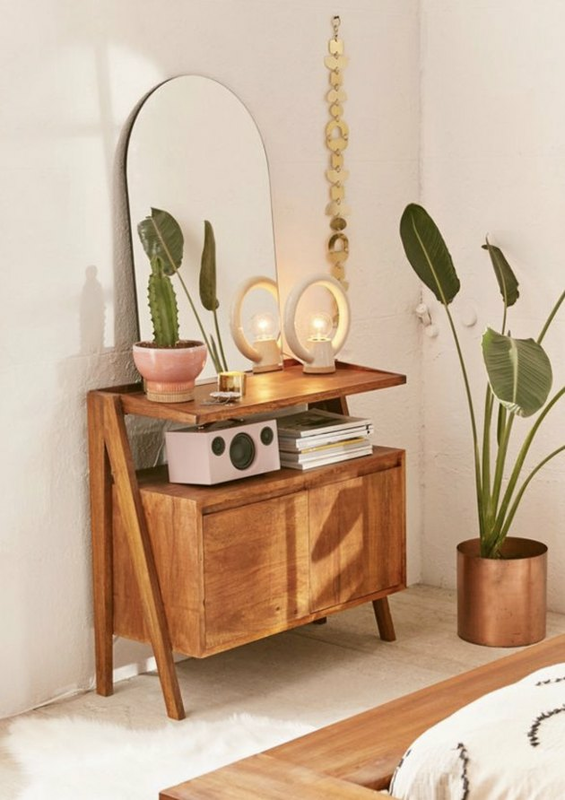 Crafted from rich mango wood, this boho console has space to display stacked books and speakers, plus a two-door cabinet for stowing away shoes or vinyls. Rest a mirror, lamp, and key dish on the top shelf for a functional landing space. 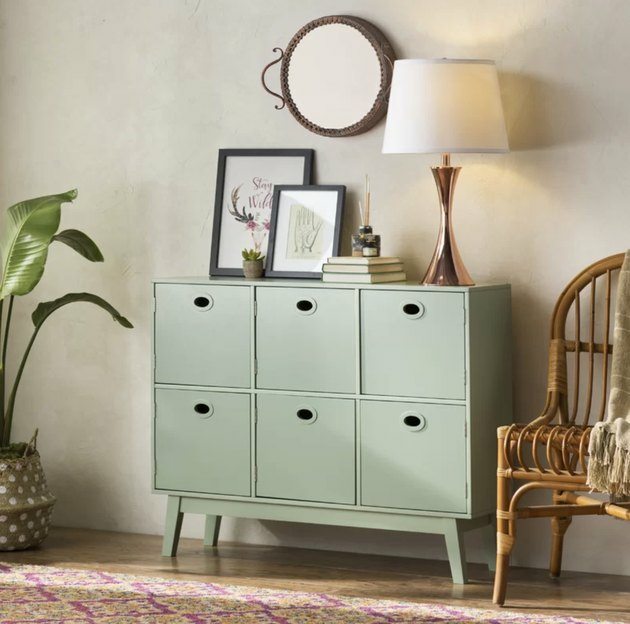 If clutter is wreaking havoc on your home, this six-cabinet, budget-friendly accent table is the answer you've been looking for: it doesn't skimp on storage, will stylishly organize your mess, and comes in the perfect mint hue. The traditional, solid pine wood frame, turned legs, and carved details make this stunning entryway table a total head-turner. Choose from black or cream, and use it to store things you might need to keep close at hand before heading out the door. Believe it or not, an entryway table that provides storage doesn't have to be an eyesore. 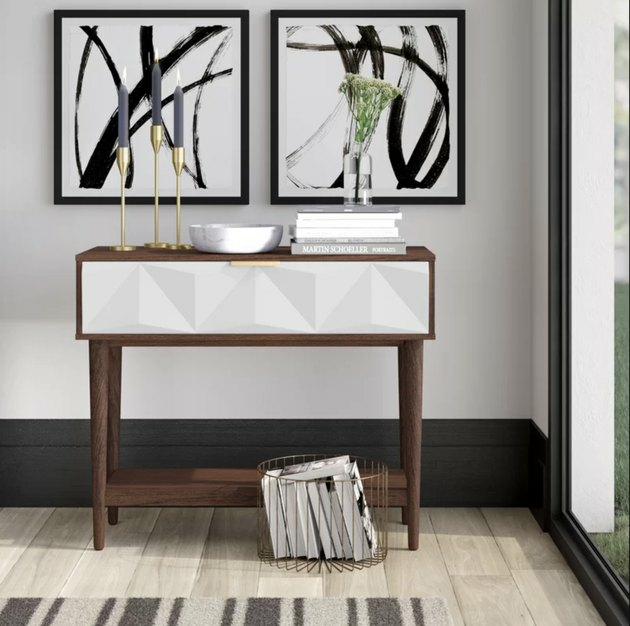 The contrasting white geometric drawer (with classy gold pull) on this console is large enough to store anything and everything. 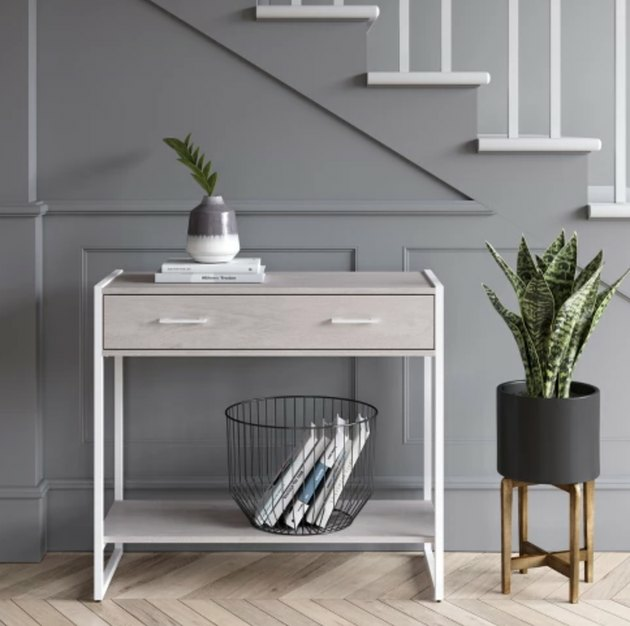 Boasting drawers and shelves, this sleek steel-frame entry table looks great near the front door or at the base of a staircase. We love the idea of adding wire baskets underneath for compact magazine styling. 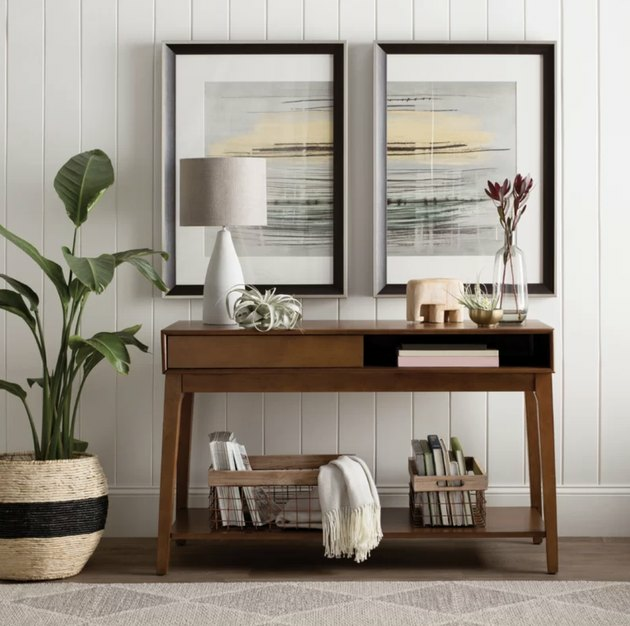 If your house has midcentury modern vibes, look no further than this versatile three-drawer console table, which will bring warmth to your foyer and pair nicely with any decor you might already have. 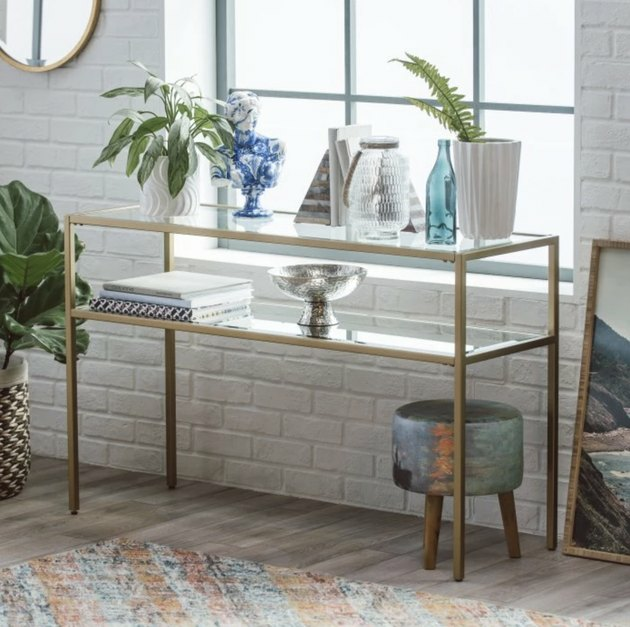 Although it's identified as a "sofa table," this console can totally work as a sophisticated yet glam place to store your stuff in the entryway or foyer. The tempered beveled glass shelves (designed to withstand shocks and impact without shattering!) and gold finish make it a beautiful piece to showcase vases, books, handmade pottery, and personal art. 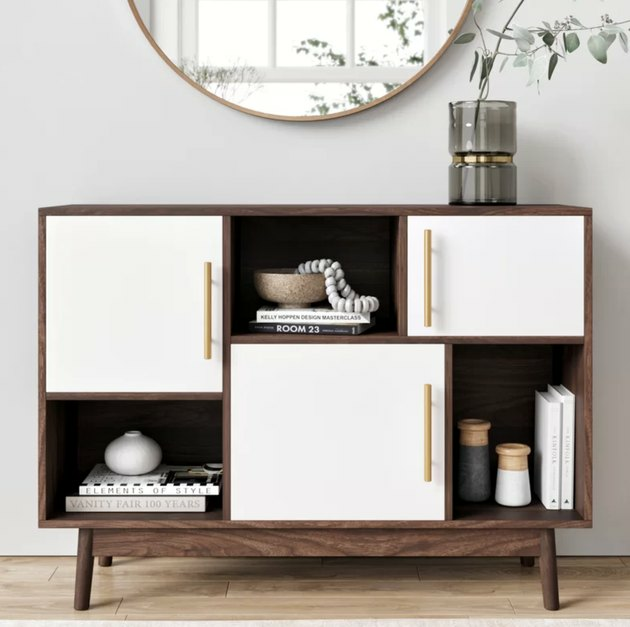 Another midcentury modern find, this entryway console has a crazy amount of storage — one large cabinet, two spacious drawers, a storage shelf, and tabletop — providing plenty of space to tuck away any odds and ends you'd rather not have out in plain sight. Want a simple yet chic storage solution for your entryway? 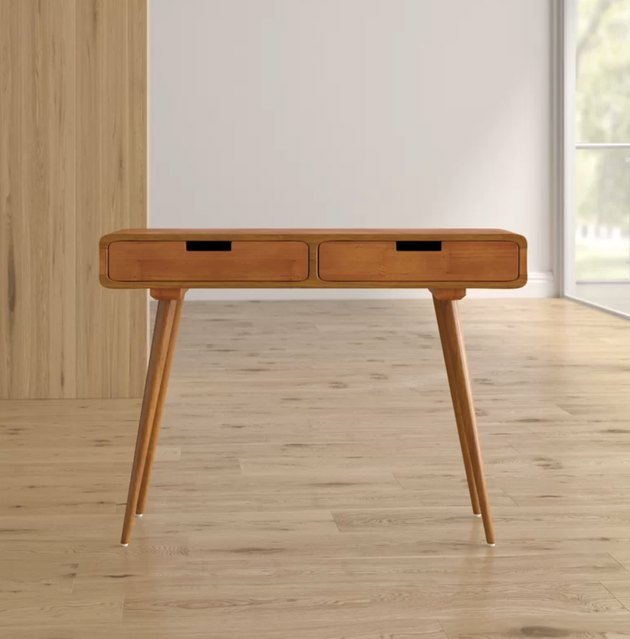 We love the vintage vibe that this midcentury modern console gives off with its long, angled legs and two sliding soft-close drawers. 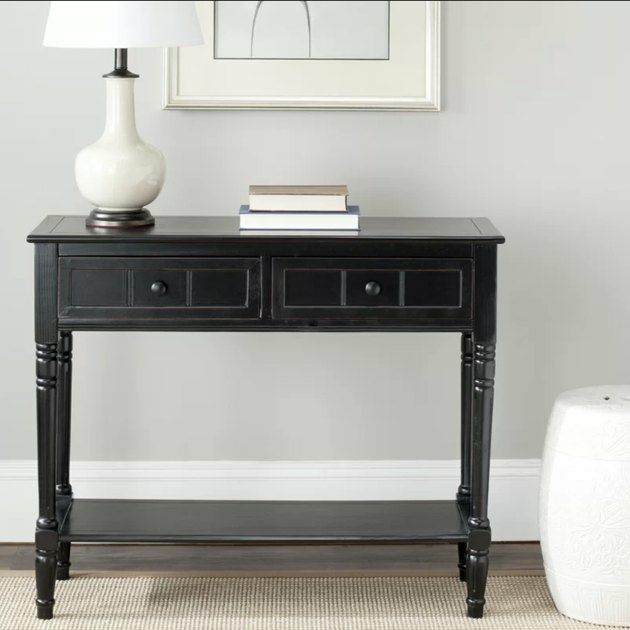 The great thing about two-tiered console tables is obvious: double the storage. 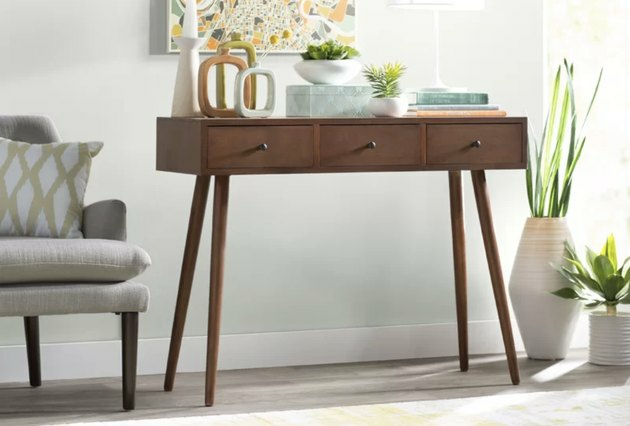 This modern pick has drawers with ample storage for your knickknacks, a smooth tabletop for displaying accent pieces, and a bottom shelf to hold even more. 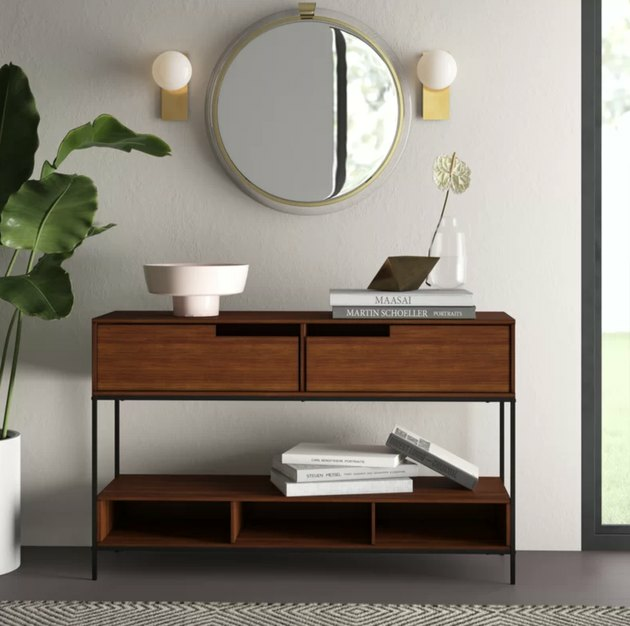 Place this midcentury modern entry table near the front door to greet guests with a warm lamp, vases, and blankets. It's bound to make friends and family feel right at home.